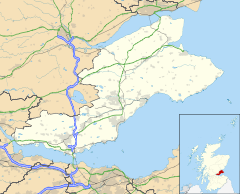 Inverkeithing (/ˌɪnvərˈkiːðɪŋ/ listen (help·info)) is a town and a royal burgh, and parish, in Fife, Scotland, located on the Firth of Forth. According to population estimates (2006), the town has a population of 5,265. The port town was given burgh status by King David I of Scotland (1124–53) in the 12th century and is situated about 9 miles (15 km) north from Edinburgh Airport and about 4 miles from the centre of Dunfermline. Modern Inverkeithing is almost continuous with Rosyth and Dalgety Bay. Inverkeithing is a developing town and has many new housing sites including one next to the town's railway station. It is a busy commuter town, with a major railway station that trains to and from several large towns and cities call at. The town is also home to the Ferrytoll Park & Ride, and is served by many buses. The civil parish has a population of 8,090 (in 2011). The name is of Scottish Gaelic origin, Inbhir Céitein. Inbhir means 'confluence, inflow' thus 'mouth of the Keithing/Ceitein. The Keithing is the name of a small river or burn that runs through the southern part of the town. Taylor (2006) notes that the name Keithing probably contains the Pictish (Brythonic) *coet, 'wood', so the Keithing burn would have meant 'burn that runs through or past or issues from woodland'. The parish church of St. Peter stands in its large churchyard on the east side of Church Street. The main part of the church is a large plain neo-Gothic 'preaching box' of 1826-27, but the western tower is 14th century. The traceried belfry openings are unusual. Built of soft sandstone, the tower is very weathered, and has been partially refaced. It is crowned by a lead spire with over-emphatic gabled dormers housing clock-faces (1835 and 1883). The church's roomy interior (now deprived of its galleries) is graced by a little-known treasure, one of the finest medieval furnishings to survive in any Scottish parish church. This is the large, extremely well preserved, grey sandstone font of c 1398, which was rediscovered buried under the church, having been concealed at the Reformation. Its octagonal bowl is decorated with angels holding heraldic shields. These include the royal arms of the King of Scots, and of Queen Anabella Drummond (d.1401), the consort of Robert III (1390–1406). The high quality of the carving is explained by it being a royal gift to the parish church, Inverkeithing being a favourite residence of Queen Anabella. The town was also the last place that Alexander III (1241–86) was seen before he fell off his horse at Kinghorn. Some texts have said that he fell off a cliff. Although there is no cliff at the site where his body was found there is a very steep rocky embankment - which would have been fatal in the dark. The town museum (open in summer) is housed in a late medieval building which was part of the claustral ranges of the town's Franciscan friary. This is one of the few remnants of a house of the Greyfriars to have survived in Scotland. In the garden behind the museum, some stone vaults survive which were probably storage cellars associated with the friary. The Battle of Inverkeithing (20 July 1651) was fought on two sites in the area, one north of the town close to Pitreavie Castle, the other to the south on and around the peninsula of North Queensferry and the isthmus connecting it to Inverkeithing. The battle took place during Oliver Cromwell's invasion of the Kingdom of Scotland following the Third English Civil War. It was an attempt by the English Parliamentarian forces to outflank the army of Scottish Covenanters loyal to Charles II at Stirling and get access to the north of Scotland. This was the last major engagement of the Wars of the Three Kingdoms and led to Scotland passing into Cromwell's control. Cromwell's troops crushed the Scots, forcing them to abandon Stirling and march south to support Charles II. Of the estimated 800 Maclean clansmen who fought in the battle, only 35 were said to have survived. The Pinkerton Burn was said to have run red with blood for days afterwards. This was a significant episode in the history of Clan MacLean, and the 20th century poet Sorley MacLean mentions Inverkeithing in one of his poems. Inverkeithing is famous for its shipbreaking at (Thos W Ward)'s yard. The second RMS Mauretania and the hull of the RMS Olympic were dismantled here. Inverkeithing forms part of the Dunfermline and West Fife Westminster constituency, currently held by Douglas Chapman MP for the Scottish National Party. For the Scottish Parliament Inverkeithing forms part of the Cowdenbeath constituency which falls within the Mid Scotland and Fife electoral region. The constituency is represented by Alex Rowley for the Labour Party. The heart of the medieval town is around the High Street and Church Street. On the High Street is the category A listed building, the Hospitium of the Grey Friars, the best surviving example of a friary building left in Scotland. The remains date either from after the Reformation or the restoration between 1932 and 1934. The building is now used as a social community centre. The town also contains one of the finest examples remaining of a mercat cross in Scotland. The cross is said to have been built as a memorial for the marriage of the Duke of Rothesay with the daughter of the Earl of Douglas. Originally, the cross stood on the north end of the High Street, before moving to face the tolbooth and then to its present site at the junction between Bank Street and High Street, further up the road. The core of the mercat cross is said to date from the late 14th century with the octangonal shaft from the 16th century. Two of the shields on the cross bear the arms of Queen Anabella Drummond and the Douglas family. Later, a unicorn and a shield depicting the St Andrew's Cross were added in 1688, the work of John Boyd of South Queensferry. Located on Bank Street, between numbers 2-4, is the impressive Thomsoun's House which dates from 1617 and was reconstructed in 1965. The B-listed Inverkeithing (St Peter's) Church on Church Street was first built as a wooden Celtic church before being adapted into a Norman stone structure, which was bequeathed by the monks of Dunfermline Abbey in 1139. The church suffered a fire in 1825 and was rebuilt in its present form in 1826. Later, the church was restored in 1900. Only the tower dating from the 14th century remains from the pre-reformation church building. Opposite St Peter's is the A-listed L-plan tower house known as Fordell Lodgings which dates from 1671 and was built by Sir John Henderson of Fordell. Behind Fordell Lodgings is the C listed building of the former Inverkeithing Primary School, built in 1894. The building suffered a large fire in November 2018. On King Street is the much altered 16th century B-listed Rosebury House, once owned by the Rosebury family. The house was formerly called 'toofall' by the Earl of Dunbar, before being purchased by the Earl of Rosebury. On Townhall Street is the A-listed Inverkeithing Tolbooth, which displays the old town coat of arms, above the front door. The renaissance tower, located at the western end of the building, is the oldest part of the tolbooth dating from 1755. A three-storey classical building followed in 1770 as a replacement for the previous tolbooth. This consists of a prison or the 'black hole' on the ground floor; the court room on the middle and the debtors' prison on the top. Inverkeithing is bypassed by the M90 motorway. The M90 links Fife to Lothian and Edinburgh via the Queensferry Crossing. The town is also served by Inverkeithing railway station, a hub for the rail network to and from Fife. Passengers travelling to Edinburgh are carried over the Forth Bridge. Inverkeithing and its hinterland are also served by the Ferrytoll Park and Ride, off Hope Street, which provides car parking and access to bus services to Edinburgh city centre, South Gyle, Edinburgh Airport, Livingston and many parts of Fife, as well as links to the Scottish Citylink coach network. ^ a b "Fife Towns and Village population estimates" (PDF). Fife Council. 2006. Archived from the original (PDF) on 1 February 2010. Retrieved 15 January 2009. ^ "Douglas Chapman MP". BBC. Retrieved 31 December 2015. ^ "Cowdenbeath constituency map" (PDF). Boundary commission. Archived from the original (PDF) on 2 December 2011. Retrieved 16 May 2011. ^ "Helen Eadie MSP". The Scottish Parliament. Retrieved 15 May 2011. ^ a b c d e f g h i j k l m n o Lamont-Brown Fife in History and Legend pp.162-164. ^ a b Fife Regional Council Medieval Abbeys and Historic Churches p.40. ^ a b c d Pride Kingdom of Fife p.35. ^ a b c d e Walker and Ritchie Fife, Perthshire and Angus pp.82-83. ^ "Fire destroys former primary school in Inverkeithing". BBC. 20 November 2018. Retrieved 20 November 2018. This page was last edited on 25 November 2018, at 09:21 (UTC).